“Of all the early Maryland photographers whose work I have seen,” photographer Marion E. Warren said, “Leo Beachy had a sensitivity for human interest that was unique” (The Eye of the Beholder: Photographs by Marion E. Warren 1940-1988). 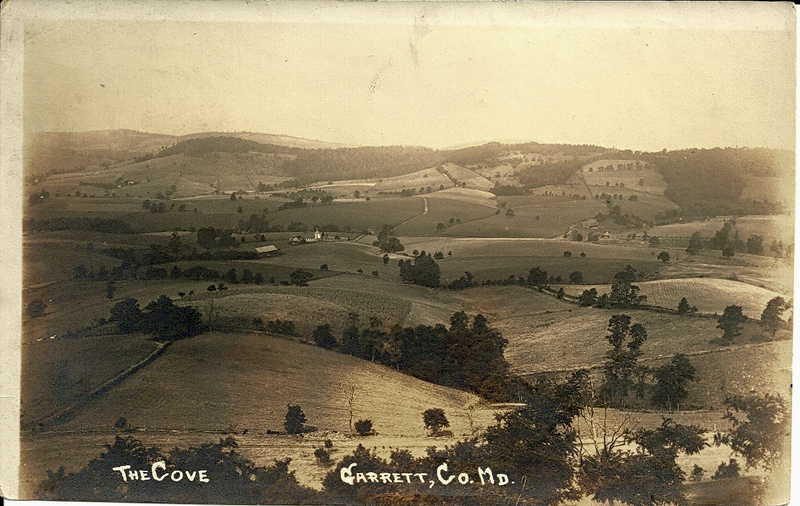 When I purchased this 5 x 7″ print of unknown vintage, a landscape entitled “The Cove Garrett Co., Md.,” I didn’t realize it was a photograph taken by the prolific Leo J. Beachy (1874-1927). It was the distinctive handwritten caption that made the connection. Beachy, a teacher, writer and photographer who grew up in Garrett County, made a number of photographs of the Cove area. It may have been taken from Garrett Highway (US 219), which offers numerous viewpoints of the lovely country north of Accident. The lane that can be discerned snaking its way from the lower left toward the center of the photo may be Cove Road. Beachy took many thousands of superb photographs of the area, its people and their pursuits during his life. He sold many as postcards at the Granstsville drug store. National Geographic even published one. But but his work was not fully recognized until decades after his death. His relations destroyed the majority of his glass plate negatives when they decided to turn his studio into a chicken house. Through a remarkably fortuitous chain of events documented in WQED’s documentary “Leo Beachy: A Legacy Nearly Lost,” his niece, Maxine Beachy Broadwater, discovered and acquired 2,700 glass plates that had been kept by Leo’s sister, Kate Beachy. Through her efforts and those of others who recognized Beachy’s remarkable body of work, the plates were conserved, digitized and painstakingly digitally repaired after years of neglect. Life magazine published a portfolio of his photographs in 1990. Today the collection can be viewed at the Grantsville Museum in Grantsville, Maryland. 2,887 images can also be viewed on line via the Garrett County Historical Society website, and now, one can order prints on the web. The Maryland Historical Society acquired a collection of Beachy’s real photo postcards, as well as 200 glass plate negatives, in 2010, and is engaged in cataloging the collection. Beachy died from complications of multiple schlerosis on May 5th, 1927. He is buried, along with his devoted sister Kate, in Otto Cemetery, near Grantsville, Maryland.